Hospitality is making you forget to be a guest. 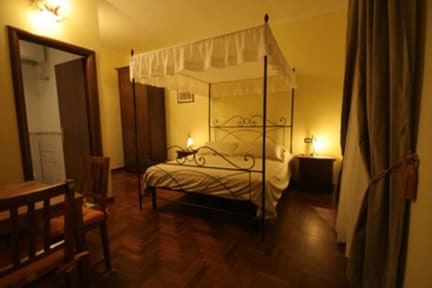 Ancient Romance is a Bed & Breakfast located in the wonderful historical and artistic area of the Vatican City, in the heart of ancient Rome. It is just 50 metres far from Piazza San Pietro and the Vatican Museums. Our B&B has just been renovated and it is situated in a splendid late 19th century building, in Via Ottaviano, on a quiet pedestrian precinct. The idea that gives life to our project consists of conciliating the luxury elegance of the style with a warm familiar hospitality enriched with all comforts and attentions typical of a four stars hotel. This is the reason why we realised three different rooms each developing a specific literary and artistic theme. Each private bath is conceived in relation to the room style. Trilussa room is inspired by the 19th century famous Roman poet. Its style represents the historical and social way of life of the early fifties Roman middle class. The tuff walls, the baldachin and the artistic representations will bring you back to the eternal city described by DAnnunzio: sumptuous and rich of contrasts. La Dolce Vita room is inspired by the 1960 famous film directed by Federico Fellini, with Anita Ekberg and Marcello Mastroianni. Its furniture respects the white and black photographic contrasts that sublime the poetry of the fellinian cinematographic image. You will suddenly be immersed in the Roman essence of the big Italian economic boom. La Divina Commedia room draws inspiration by the masterpiece of the Italian literary tradition. The absolute uniqueness of Dante Alighieris artistic genius is celebrated through a furniture style that will leave you without words, bringing you back to the 14th century. You will appreciate the typical colours and suggestions of the early Middle Ages. The reception will welcome you with the pleasant sound of Jazz music and the sober vivacity of the furniture which will make you feel at home.